Fix Failed to detect the location on Pokemon Go on iOS & Android: Most of us are already enjoying Pokémon game on their android and ios devices. However, if you need a guide to install Pokemon go on android or ios smartphones proceed further. On successful installation of Pokemon go game on android or ios smart phones your first and foremost step is to create an avatar to start the play. After the avatar is created, Player’s current location along with a map of the player’s surroundings is displayed. As the player travels the real world, their avatar moves along the game’s map. Different Pokémon species reside in different areas of the world. All you need to catch all the Pokemon species residing or nearby to you. Most of the time you will be able to start playing, But in some cases, you may throw out with an error Failed to Detect Location in Pokemon Go. This turned as an annoying error. However, there is an easy fix to solve.Proceed through the tutorial, Here we provide you the best ways to Fix the issue Failed to Detect Location on Pokemon Go game in both Android and iOS smartphones. So you have installed Pokemon go game and running first time on your device. Soon after initializing the game most common error faced by most users is Failed to detect LOCATION of Pokemon Go on your android or iOS devices. So guys following devices and operating systems can make use of this tutorial to fix the error. Wish to see a complete game play or features go to Pokemon Go PlayStore or Visit Official Pokemon Go App Website. Android smartphones like Samsung, Sony, Asus, Lenovo, Motorola, HTC, Xiaomi running on any operating systems KitKat, Lollipop or Marshmallow and iOS devices too can follow below steps to solve the location problem on Pokemon Go. I will be Solving the Failed to Detect Location error in Pokemon Go by 2 methods. I may not guarantee these methods will resolve the fix. So try both of them and place your feedback here. Turning on the location of your device is also one of the cause for Failed to Detect Location in Pokemon Go game. So to fix the error you need to turn on your location settings. Follow below steps. Open settings of your device and Open location. Turn on the location from the location toggle button. One more important setup to fix the error, You have to set the mode of the location setting to open mode and High accuracy for playing Pokemon go. Cross check the settings once you are done, Open the Pokemon go app now the red banner showing Failed to detect location will disappear. Go to Settings and “About phone”, Hit build number numerous 4-6 times. This will open up developer options. From there Disable mock locations. 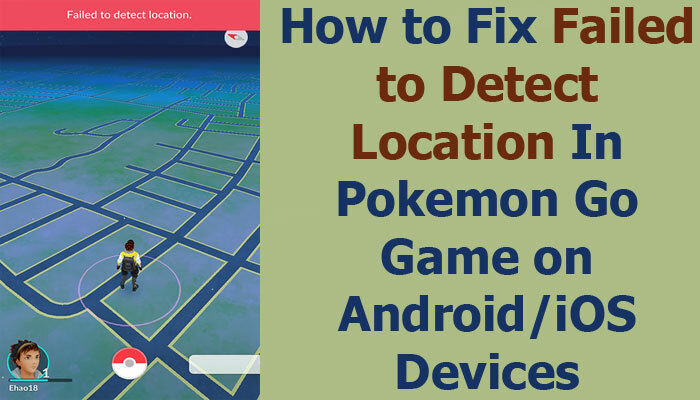 This is all about How to fix or solve Failed to detect the location on Pokemon Go on Android and iOS smartphones. If you have any questions or troubled with issues shoot your comments below. As this is the new game everyone is trying to solve for issues found, So share here if you have any other methods also in the comment box. Widespread the solutions over social media and help others. Can I catch pokemon or spin pokey stops with failed to detect location? I try above both methods but still m getting same error, how can I resolve this?